Tigers Eye Patio Jewelry adorns your outdoor tabletop, and provides soft lighting for you and your guests. These gemstone patio lights have an oval gemstone cut design. Made with quality ceramics, the Tigers Eye gemstones have brown and creamy beige and is thought to give a sense of spiritual well being. 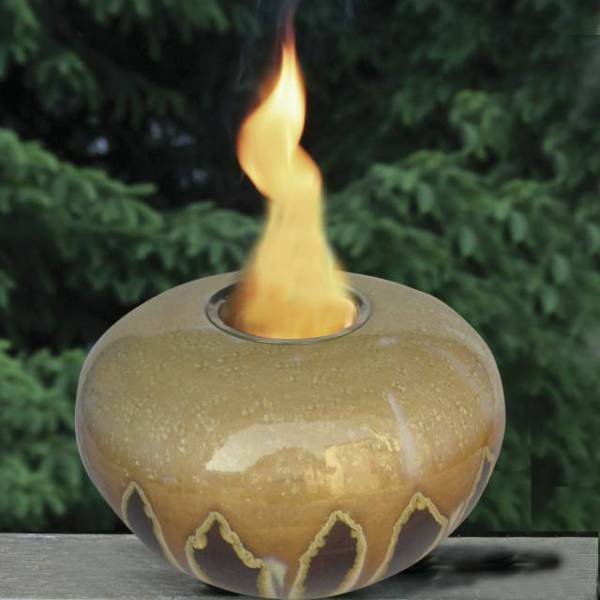 Each Tigers Eye Oval Cut patio light comes with a stainless steel reservoir for the Gel Fuel which it burns. Every patio firepot has a decorative, stainless steel cap or finial to use on top when not in use. It gives a nice finish to the piece when not in use. Bring warmth and soft lights to your backyard with the Tigers Eye Oval Cut Patio Jewelry by California Outdoor Concepts.They come in sets of four lights with the oval cut or you can purchase just one light separately. The oval cuts are approximately 8 inches X 8 inches X 5 inches, and weigh 4 pounds each.